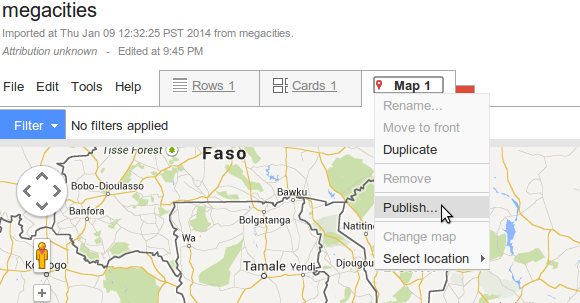 Adding Fusion Tables as a layer to your Google Map is a great way to display data. One of my favorite aspects of Fusion Tables is the flexibility and ability to customize the style of the added Fusion Table layer through queries. This tutorial is about how to make simple slider using fusion tables and Google Maps API with little support from jQuery. In this tutorial we will use JQuery User Interface that's great tool for adding jquery features. At http://jqueryui.com/slider/ you an chek all of the slider options. We are going to use minimum, you can check out the demo there to see all. This tutorial is for total beginners I assume that you have some knowledge of HTML. You don't have to be an expert, just remember coding it's intelligent copy & paste. 1. First you need to upload data to Fusion Tables and create map, how to - you can check in this tutorial . 2. Now it's starting to be more fun, you need to create FusionTableLayer, the best way is to use Fusion Table Layer Wizard from Google. Just follow instructions. 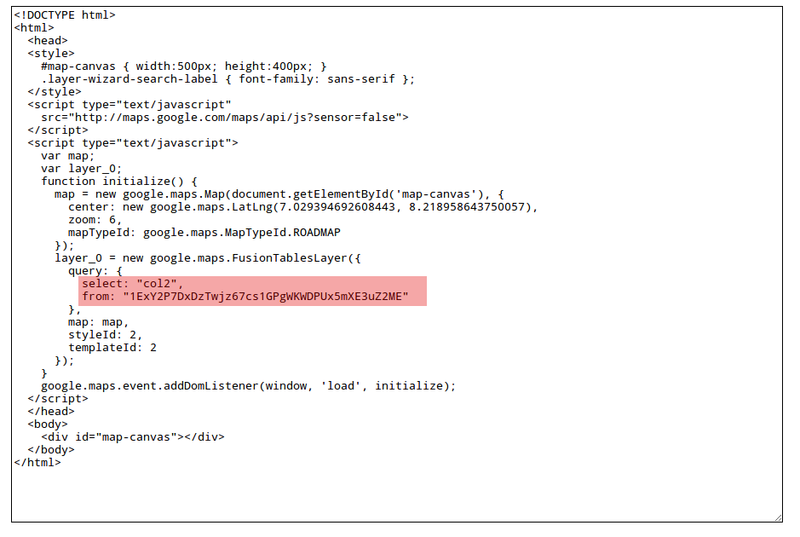 TIP: If you get error "no viz=MAP found" just copy the publish link from MAP tab. And remember to share your table first. 3. Finally we got our FusionTableLayer, all we need to do is to copy ID only. Let's try to keep it simple so don't change other parameters for now. 4. Copy ID and keep it in notepad or other text editor like Notepad ++. Now download repo from GitHub and open slider_tutorial_example.html file in text editor. 6. Now we need to set parameter of our slider [ line 98]. What is important, this slider will query only selected column (one column). 7. Save it and run in your internet browser, if your set everything correct you should see your map. If not you need to go back and correct. 8. Now we can play with slider settings, depending on data we store in our fusion tables [line 88-91].